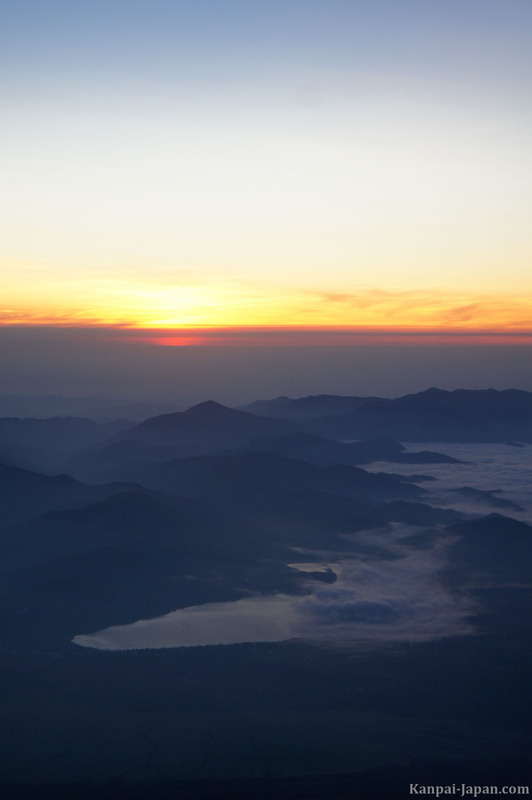 He who climbs Mount Fuji once is a wise man, He who does it twice is a fool. 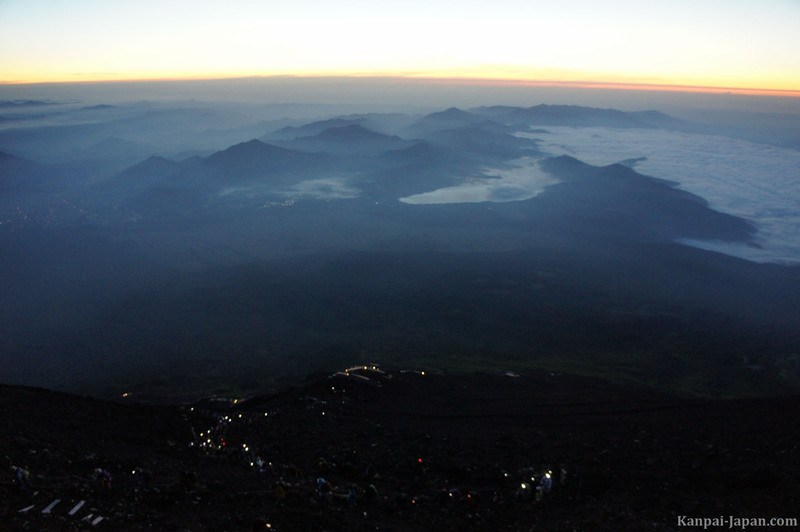 Tokyo aside, Mount Fuji is probably the most famous tourist attraction in Japan. 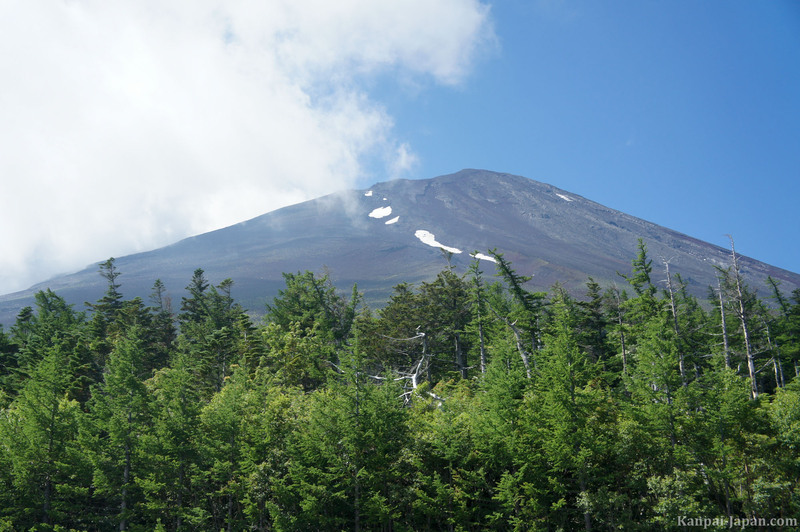 Its influence at the international level is so great that many legends and fantasies are raised by the 'Fuji San' (the mountain's original name, and not 'Fujiyama' which is a misreading of kanji, the Japanese characters). 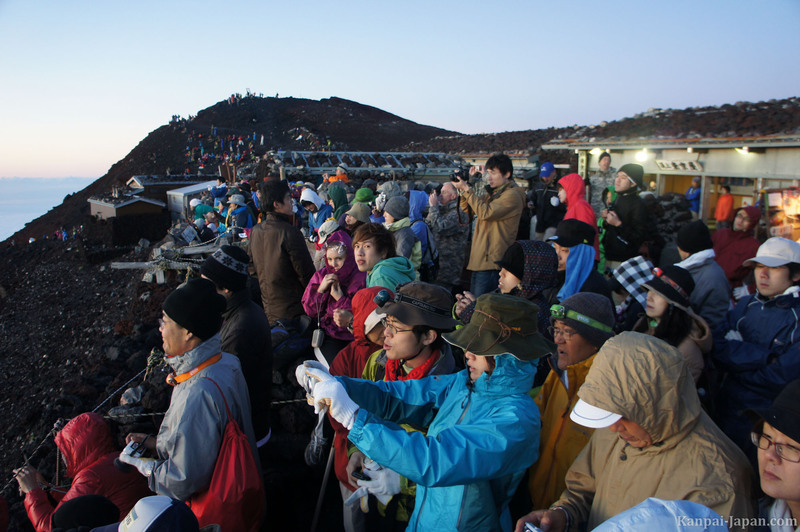 It is common to say that climbing Mount Fuji is becoming Japanese. After four trips in Japan, it was time for me to tackle its highest mountain (3776 meters). Here's a full report with pictures and advice if you want to do the same. 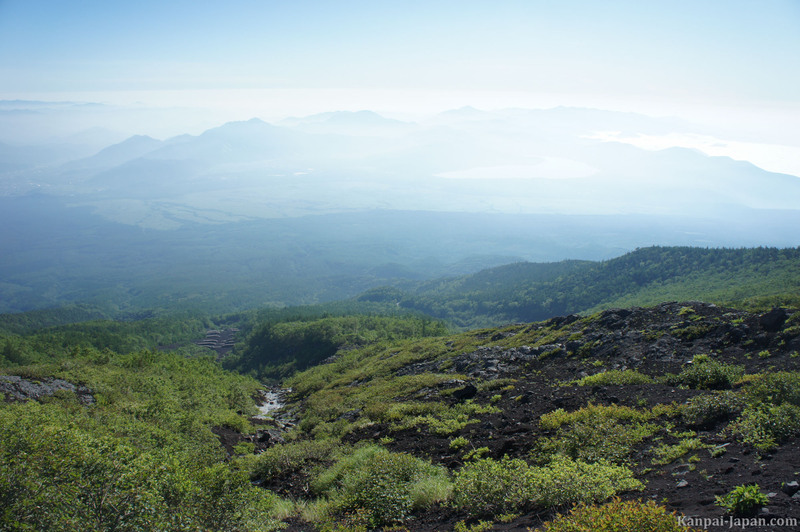 To cut short some misinformation: climbing Mount Fuji is far from a walkover. It requires a physical condition, with good preparation. Climbing is limited to a short season: from July 1 to August 31. During the rest of the year, access is at your own risk and, in any case, this will be a lot more difficult. 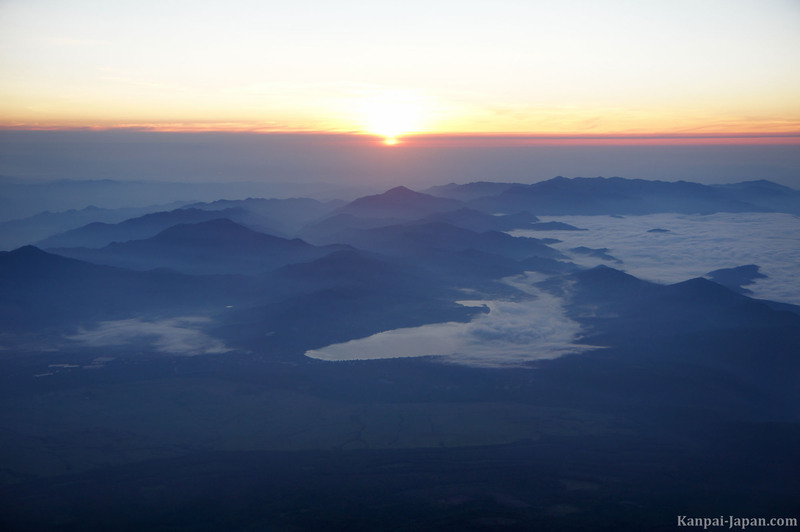 It is safe to assume that there are two slots for climbing Mount Fuji which share the goal of contemplating, from the top of the mountain, either sunrise or sunset. I chose the first option. 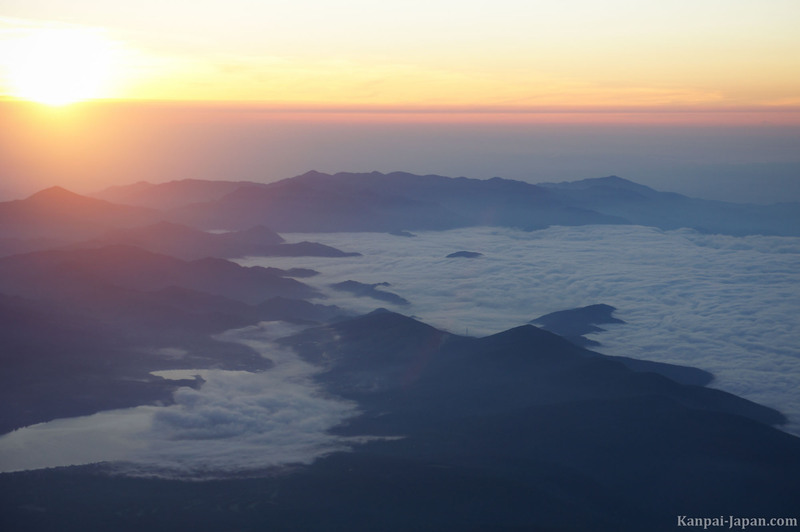 After all, 日本 / 'Japan' means 'origin of the sun', hence the expression 'land of the rising sun'. To do that, we had to climb up at night and go back on early morning. 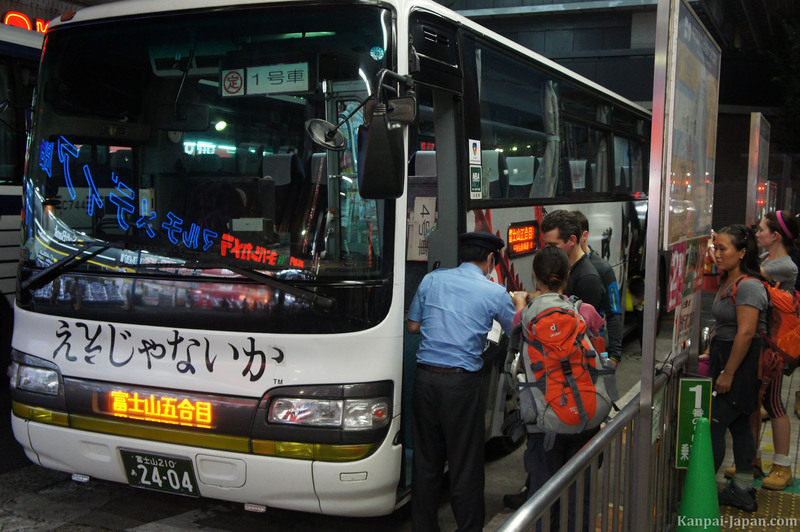 From Shinjuku in Tokyo, a bus commutes several times a day in one way or the other. The round-trip rate costs 5200 ¥en (approx. US$68). My advice here would be to book your ticket in advance via this web page. Payment is cash on the spot (in front of Yodobashi Camera) up to a few minutes before departure. 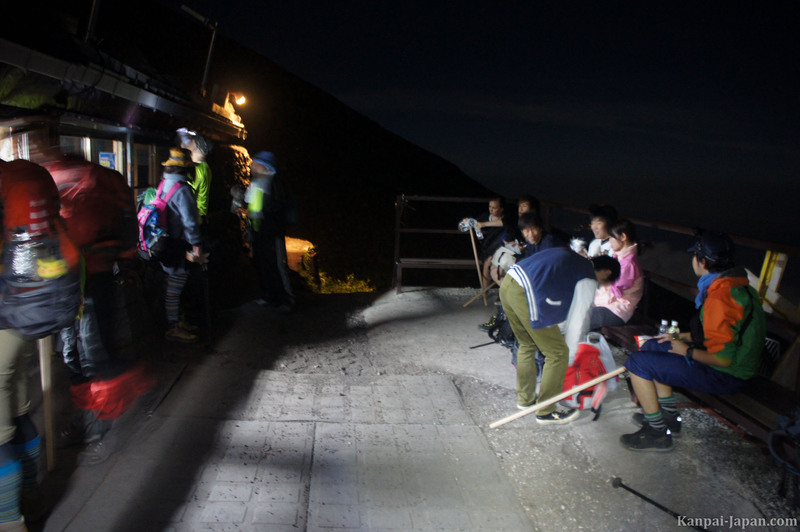 The one-way bus trip takes about two hours and a half up to the fifth station, which is the hike's starting point for most climbers. 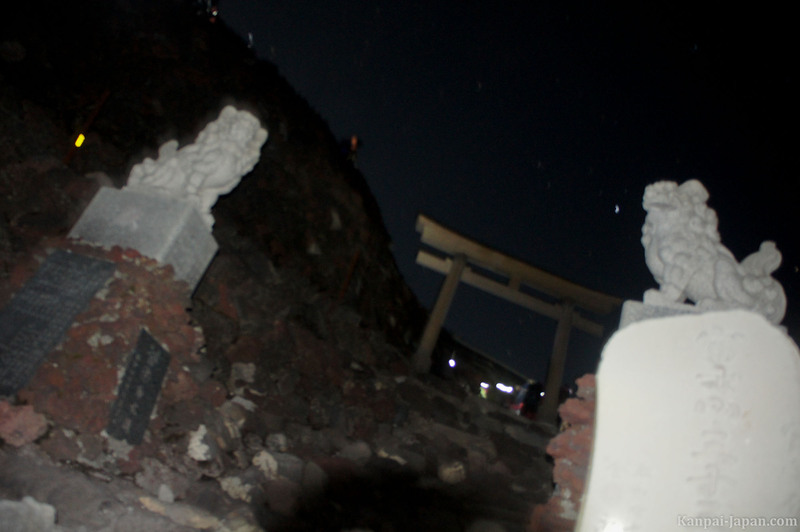 You should know Mount Fuji has ten stations in addition to its relay-huts, the first one being at the base of the mountain, and the tenth one located at the summit. 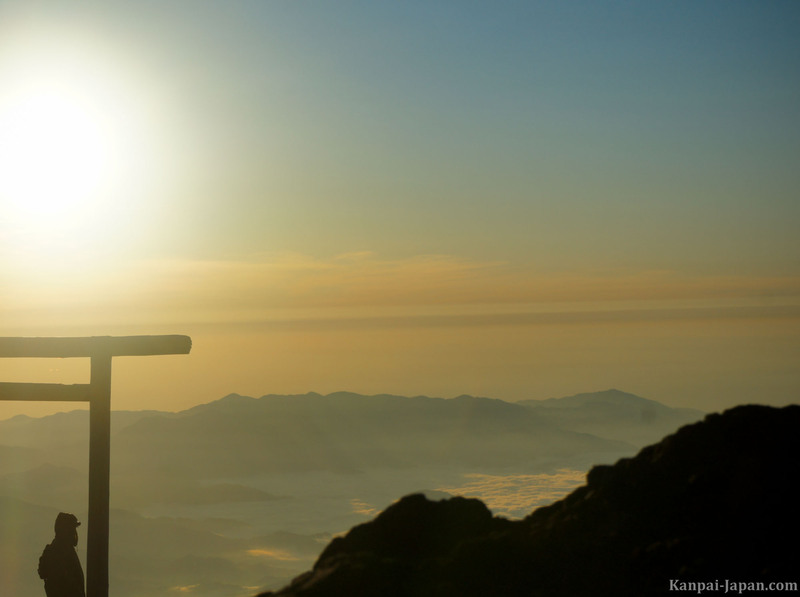 The fifth station named 'Kawaguchiko' is at an altitude of 2305 meters, which means you have to climb nearly 1500 meters, spread over to a six kilometer walk. Keep in mind that if this hike is already quite a challenge, it can become hell on earth during traffic congestion. 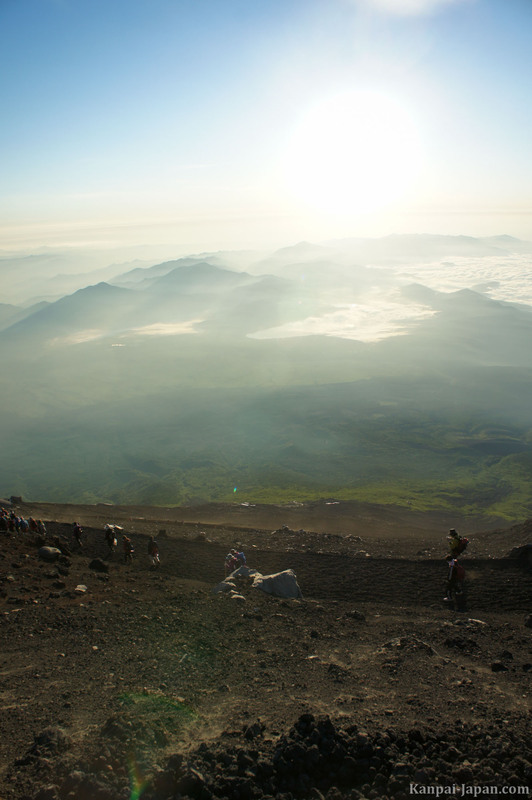 Therefore, avoid at all costs to plan your Mount Fuji climb on a weekend day, let alone during Japanese school holidays (starting mid-July) and especially not during Obon (a Buddhist festival which runs from August 13 to 15). We took the last bus of the day, on a Thursday of early July. We left from Tokyo at 7:30PM and arrived at 10. 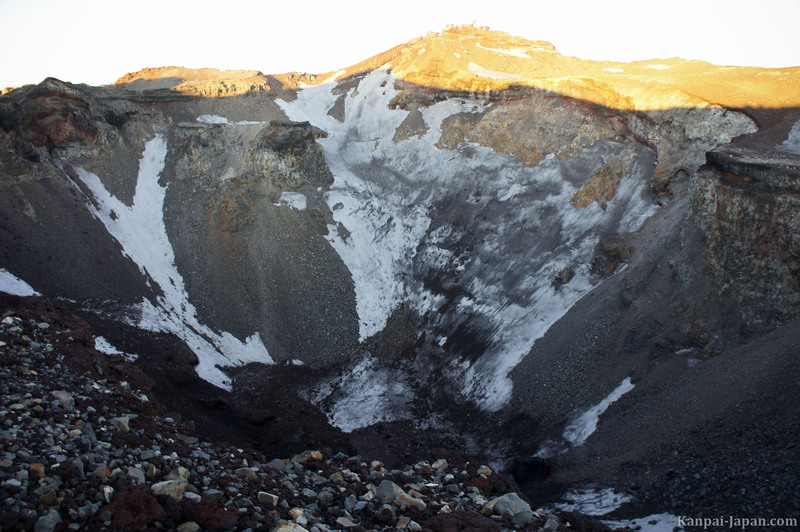 Temperatures were still around 30°C in Tokyo, easily ten degrees less at Mount Fuji's fifth station. At the summit it freezes every night, even in summer, and winds add a cold sensation. So you should dress in consequence: a pair of pants in which you are comfortable with possibly long underwear, thick socks, several layers on top, a windbreaker and a cap / hood. 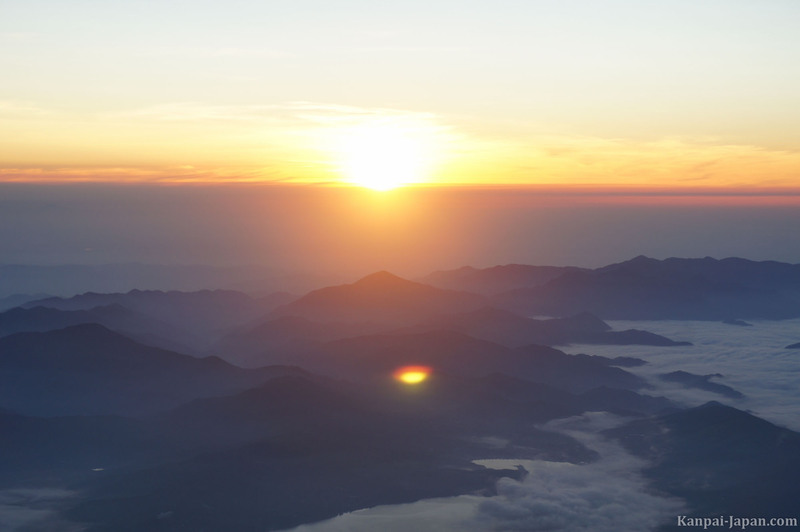 You may sweat during the climb, due to physical efforts, but the body feshens very quickly and when you're waiting for the dawn at the top of the mountain, you'll be glad to be well covered. 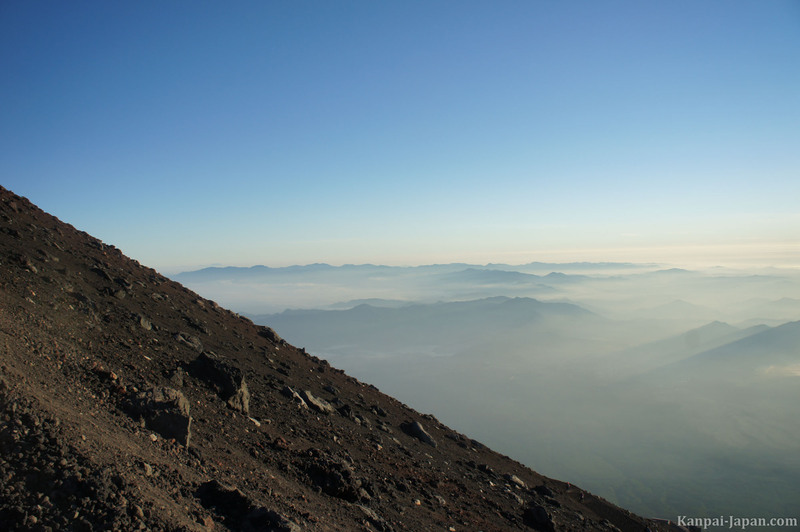 Climbing Mount Fuji is quite a challenge. You'll find it doable if you're athletic but not everyone can say so. 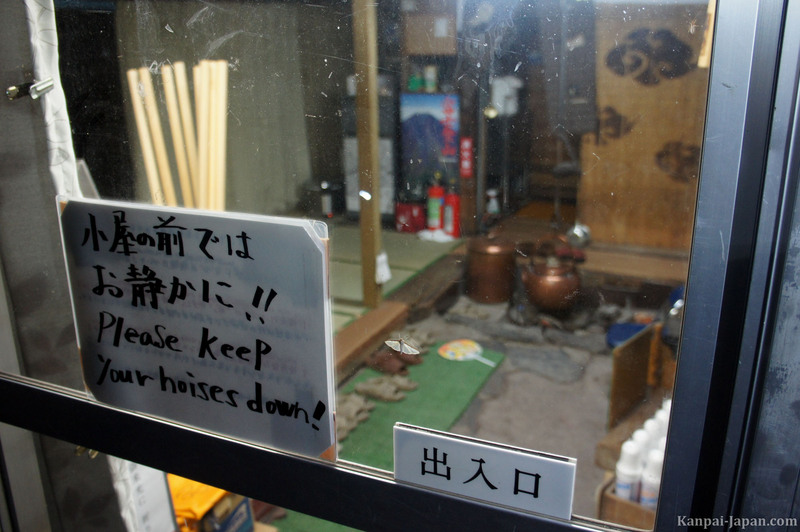 Your will obviously prevails since many elderly Japanese make it to the summit. Certainly not as fast, but it shows that who has decided will manage to get to the top. 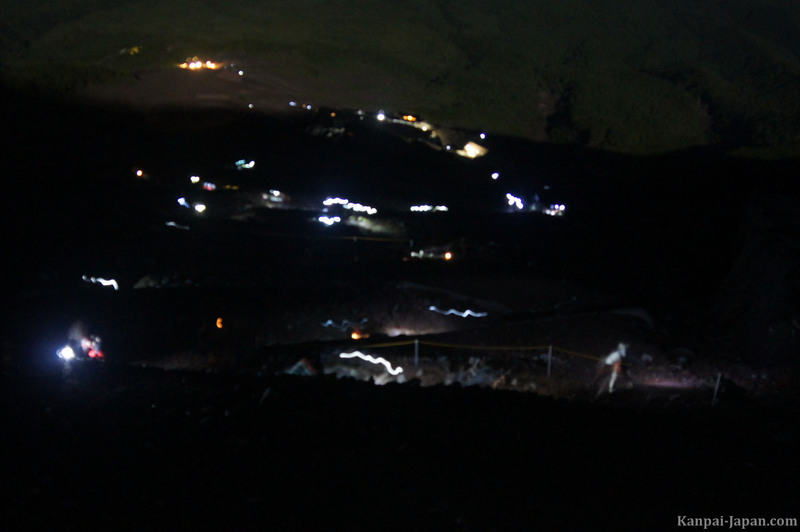 We climbed from fifth to tenth station in 5h15, counting 10-minute pauses in each station and traffic jams on the last hour, near the top. 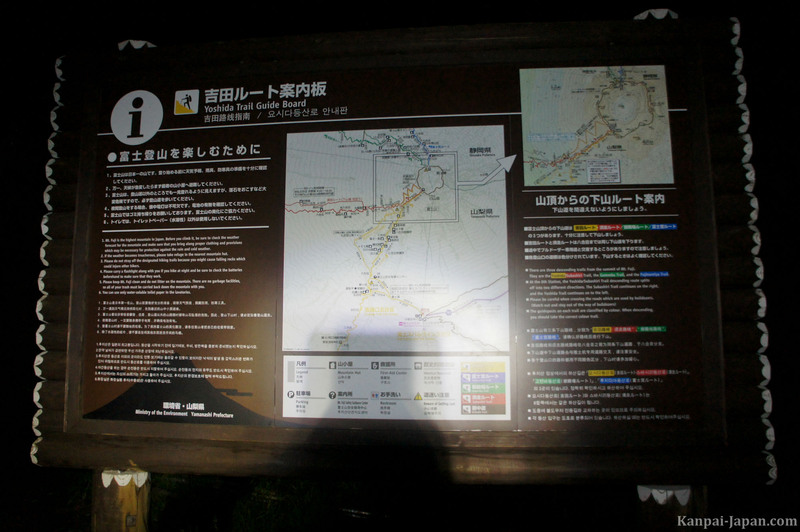 The walk begins simply with 'Yoshida trail', then it thickens seriously from the seventh station with a very rocky climb. The hiking boots are essential. 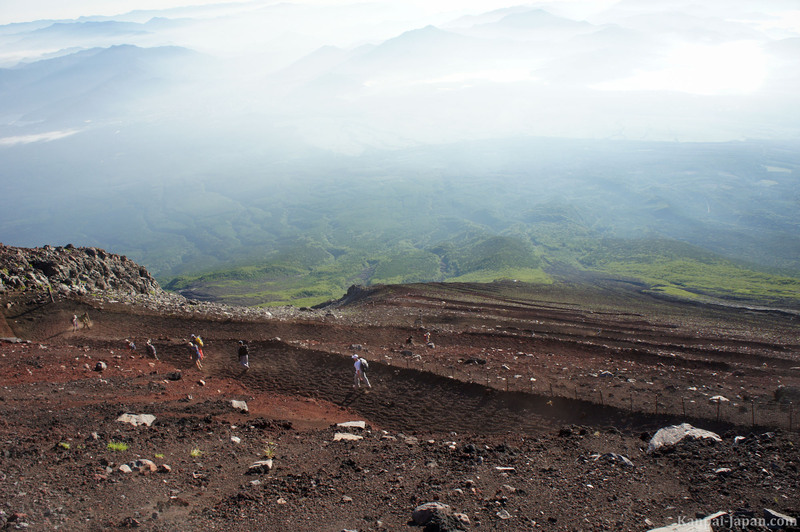 Do not even think of climbing Mount Fuji in sneakers! 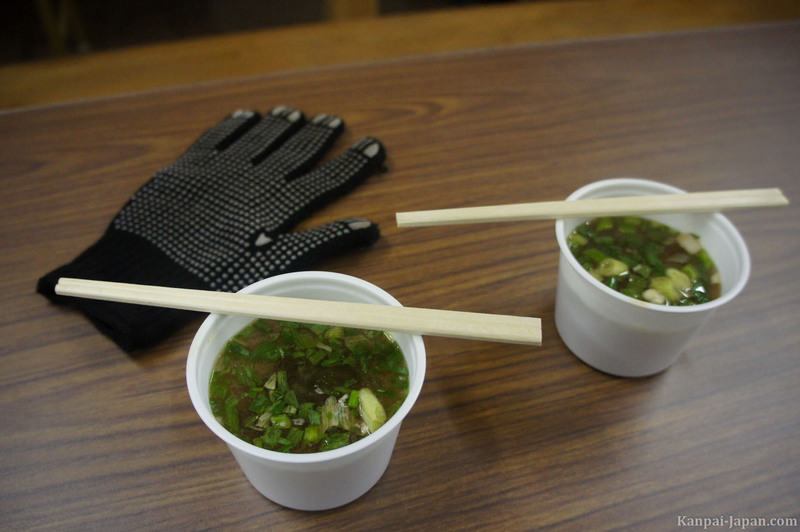 I also strongly advise the headlamp and grip gloves, easily findable in a '100 Yen shop' in Japan. 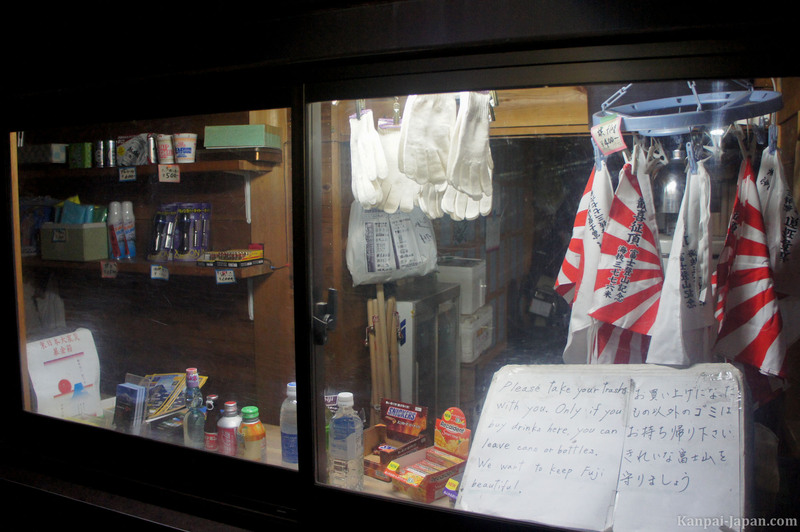 Throughout the climb, shelters welcome you and sell stuff at prices increasing as you approach the summit of the moutain: drinks, ramen noodles / miso soup, and oxygen bottles (which you'll most likely won't be needing). It is even possible to sleep in some of these large huts. 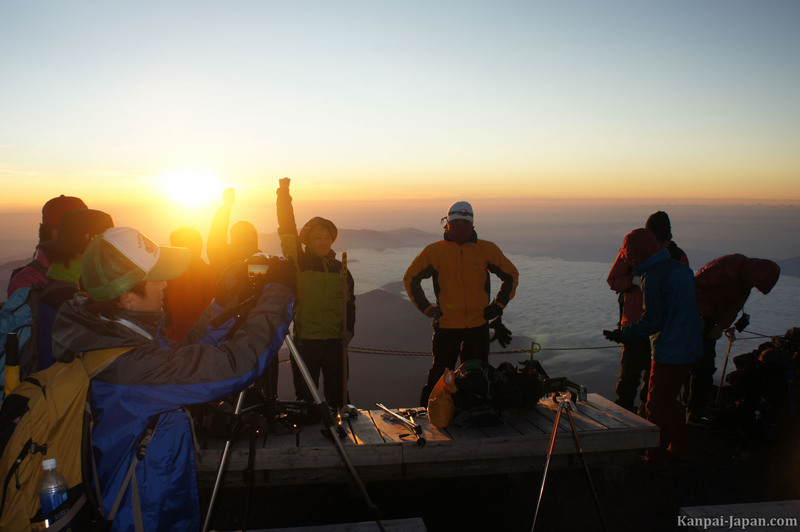 To climb Mount Fuji is a fascinating experience: from cordial exchange during breaks, to murmurs of effort supported by all the climbers on difficult passages. 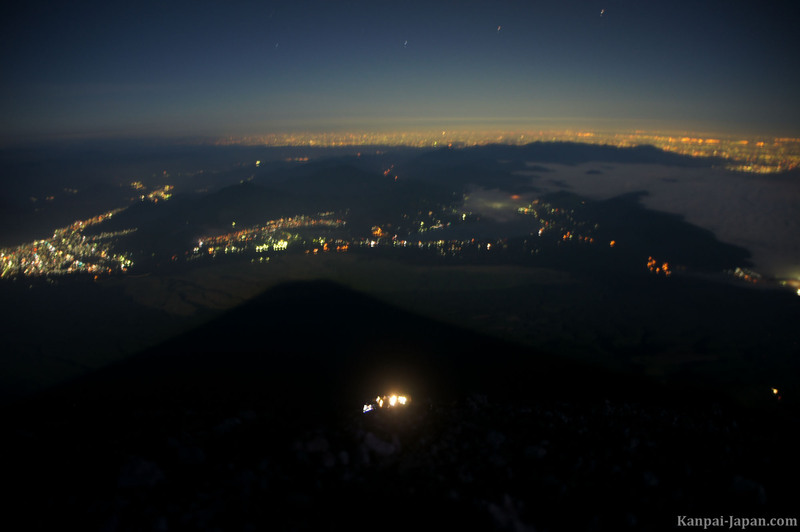 Near the summit, the trail tightens, the silence becomes as unreal as the shadow of the majestic Mount Fuji is designed by the full moon. National Park officials encourage us and give us the time remaining before arriving to the summit. 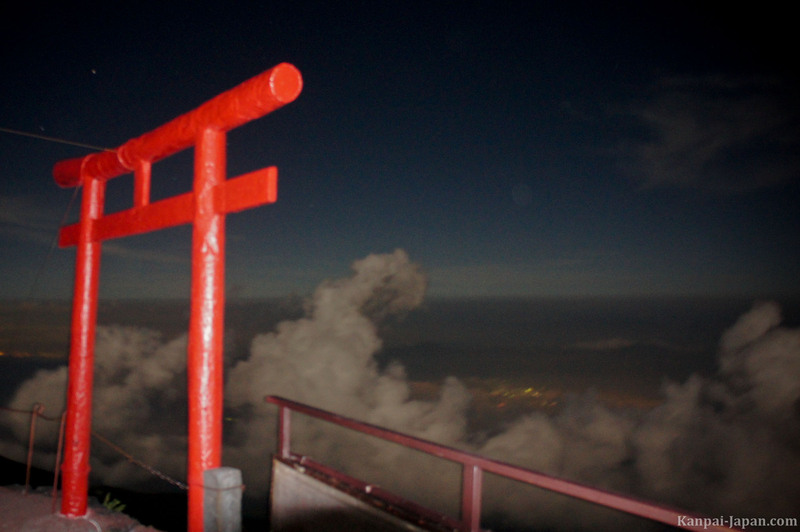 Then we cross the last Torii (gate) and here we are, at the summit as the horizon increases, admiring the region of Hakone to Tokyo Bay, surrounded by a sea of clouds. 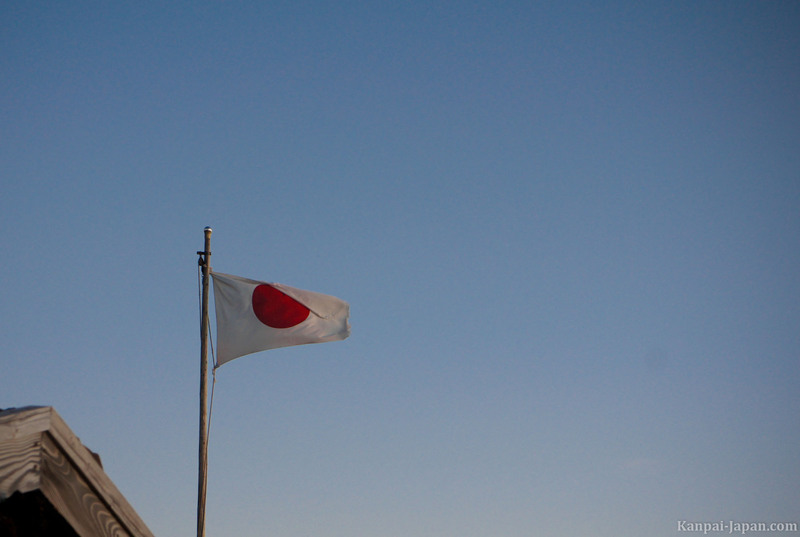 The rising sun offers a wonderful sight as people start shouting 'banzai! ', their flag flying in the wind while the national anthem is played through ageless speakers. The descent is another ordeal. Fun at the beginning because it's very steep and sandy, it soon becomes surprisingly exhausting. With exhaustion from the ascent which mobilized all leg muscles, now your joints are being sought, particularly ankles and knees. The quadriceps will again be used and I'd definitely recommend to stretch these afterwards. It took us two hours and a half to complete the descent, but it seemed surprisingly longer probably because of exhaustion, heat and repeatability. 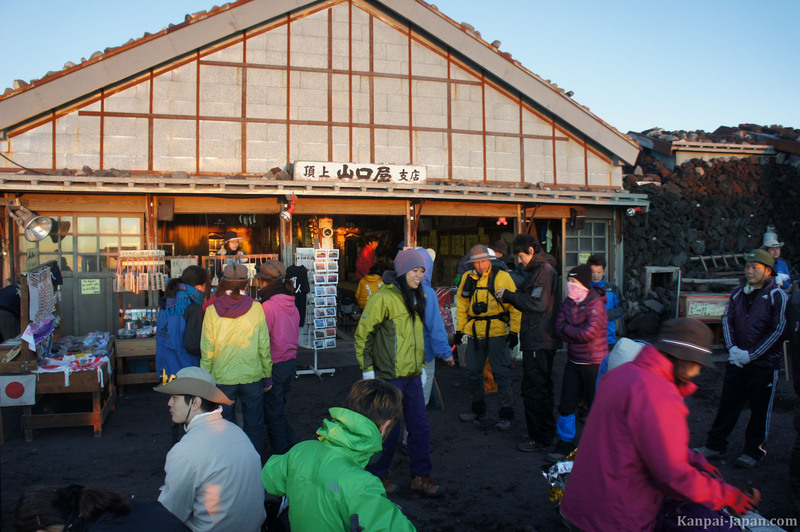 Once back at the fifth station, while waiting for the first return bus (at 10am), the place provides souvenir shops and restaurants for tourists. 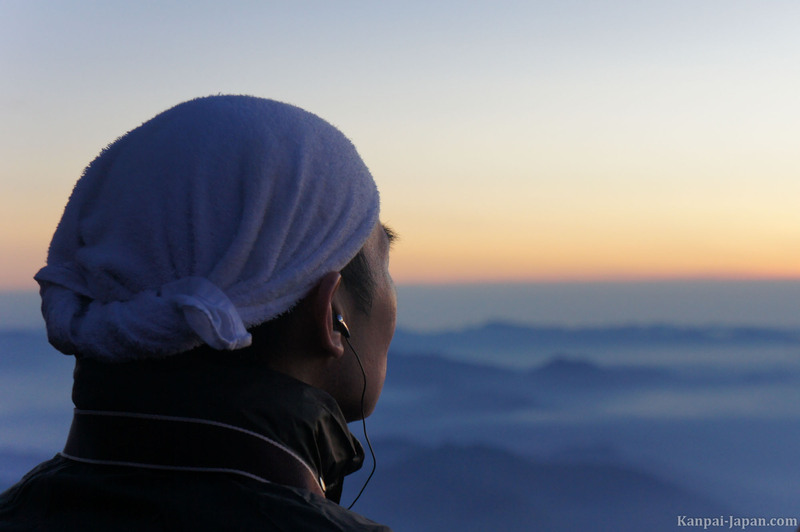 You'll meet hikers fresh and ready to ascend. 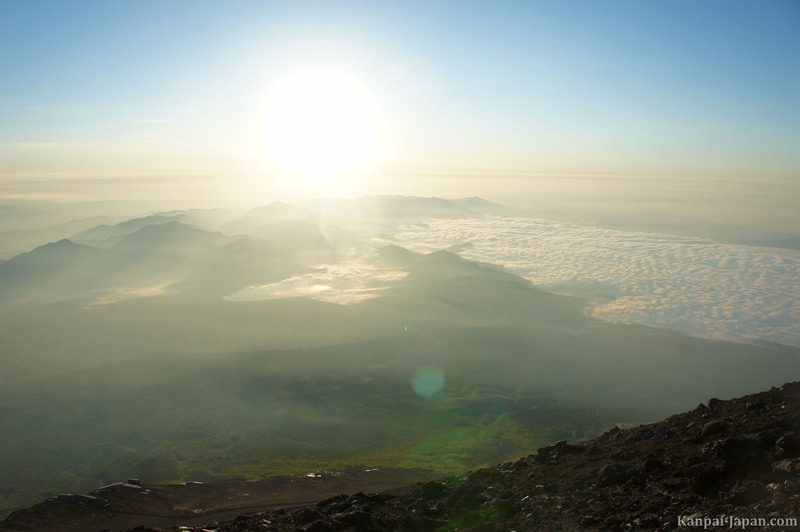 Climbing Mount Fuji, anytime, is a great experience, essential for any traveler to Japan.